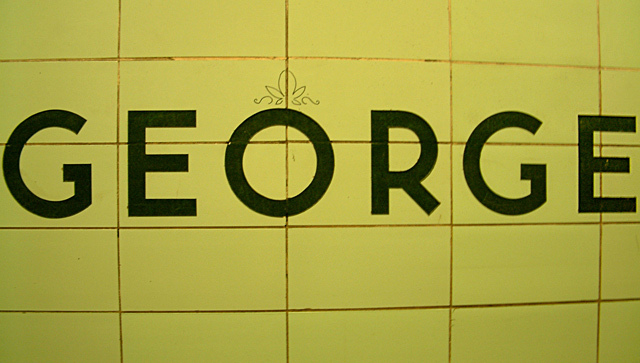 Torontoist spotted this bit of loveliness in St. George Station on Monday. Unlike most fugly marker graffiti, this is an elegant and playful addition to the station’s signage. It looks like the floral flourish on a crown, or possibly a fleur-de-lis. What compelled someone to draw this on the station wall? Is it a political statement, or is it simply meant to elicit a smile? Whatever the intention may have been, this piece of graffiti has a certain charm. It takes us back to the age old practice of drawing moustaches, specs, and facial tattoos on pictures in magazines and high school yearbooks. Enjoy while you can—it’s on the westbound platform at St. George Station—because this decorative graffiti won’t be up for very long. Filed under George Station, high school, Kevin McBride, discovery, drawing, graffiti, hmmm..., magazines, subway, transit, Vandals!